The advancement of medical knowledge is quintessentially based on the authentic and reliable scientific research and publications. This is in addition to the recently mandated requirement of original research publications in indexed journals to ensure career progression in academic/medical institutions; thus, the need for ‘publications’ in scientific medical scholarly journals has increased substantially. On the other hand, this has given an unparalleled rise in the number of standalone journals and publishers ‘predatory’ is the term, who are ready to process the manuscripts on priority with almost guaranteed publication, at a cost, but having no credibility to the research being published. To foster awareness creation among students at the post-graduate level and for faculty of medical colleges and research institutions, it has become very important to avoid these predatory journals. It is high time that the thinking among researchers of ‘publish or perish’ be changed to ‘Publish and Flourish’ by adopting stringent measures which have evolved over time to curtail this birch of predatory publishing. Researchers should now take the road less travelled. This review article aims to highlight all the relevant and important points about the threats posed by predatory journals and also suggests possible ways to overcome them. Republished with permission from: Jain NC, Khan GS. Predatory Journals: A Downside on Research and Hampering the Impact and Relevance of Scientific Outcome. RUHS J Health Sci 2018;3:99-105. The unscrupulous threat that has emerged to dwindle the integrity of academic publishing, popularly known as ‘predatory journals’, is exploiting the open access (OA) model by corrupting the peer review process, which is often absent or minimal in such predatory journals leading to misreporting of scientific data and results which is very direful for the community as a whole. After working in a research area, if one has been involved with research projects in the past years, the final step in the research process is always about disseminating and delivering research outcomes/results for the benefit of the society and people. Typically, all researchers (junior and senior scientists, faculty and students) fulfil the first step by presenting their research work at several local, regional, national or international conferences. These activities are important, but ultimately, they need to publish the work and their findings in scientific journals. Now comes the most important and critical part that where to and how to publish the work in renowned and high impact factor (IF) indexed Journal Citation Reports (JCR) journals for recognition of the findings. This is where utmost care and responsibility needs to be undertaken so that one does not fall to the fate of the so-called ‘Predatory Journals’, which have evolved with time, ruthlessly to exploit researchers years of hard work, time and devotion one gave for the research work to come to some good conclusion and results. Recently, the numbers of such predatory journals have outgrown, they just prey on researchers by sending invitations to publish papers in the journals, so it is high time that these predatory journals should be avoided and this is possible only when the researchers are aware of the harm they are rendering. A sensible and sound journal selection before submission of work would in most of the cases, if not all, contribute to a major extent in avoiding this mishap known as ‘Predatory Journals’. This case is a learning experience particularly for the early career and developing country researchers. These predatory journals did not catch the sight of many researchers worldwide until Jeffrey Beall, a research librarian at the University of Colorado in Denver, after coming across increased number of spam mails loaded with invitations from such journals, did intensive research on these and later developed his own blacklist of what he calls ‘Predatory OA journals’. There were 20 publishers on Beall's list in 2010, and now, there are more than 300. It has been estimated that there are as many as 4000 predatory journals today, at least 25% of the total number of OA journals. Moreover, to obtain a blacklist of dubious journals and publishers, the archived copies of Beall's list may be useful., Conversely, the whitelists can be obtained from PubMed/MEDLINE,, and Directory of OA Journals (DOAJ), Master Journal List of Clarivate Analytics and Publons. In addition, OA Scholarly Publishers Association (OASPA), Committee on Publication Ethics (COPE), International Committee of Medical Journal Editors (ICMJE), International Association of Scientific, Technical and Medical (STM) Publishers and Centre for Journalology website may also be useful in providing the list of legitimate journals or publishers. To find a journal with an IF, JCR may be useful. Furthermore, Memon, in one of his reviews on menace of predatory journals, suggested the authors from the developing world that they should confirm, before the submission of their work, the legitimacy of the journal and its publisher. They should seek help from their senior colleagues and those with expertise in journal selection. The need to publish in JCR indexed journals is very important as it keeps track of the numbers of citations to articles published in top-tier scholarly journals. Measuring the number of citations, articles in a given academic journal received on average tells about its IF, which is used as an indicator of the importance of a journal in a field, with journals with higher IFs being more important. Furthermore, one should be keen in checking the latest IF with JCR and cross-check the journal's identity with its International Standard Serial Number (ISSN) (online/print), which is unique for every journal/periodicals. However, that does not mean that the journals having lower ranking in the JCR ranking are not important and should not be used for publications, it might just be an indication that the journal serves a niche expert audience, has a very specific subject matter or serves a small subfield. In these cases, it may be the best journal for your purpose, even though it is not one of the top journals in its discipline. All the basic and relevant points which are important from the view of avoiding these predatory journals and going for the right journal choice will be further discussed in this article. Journals are the basic source of the current information in any science-based field and are the main formal information channels for scientific communications. One of the major goals of these scientific channels is to disseminate qualified scientific information. It is difficult for clinicians, scientists and health policy analysts to keep up with more than 2 million new research articles published each year in medical and scientific journals. Furthermore, many published reports are of poor to average methodological quality and most of the scientific articles are never cited. One approach to facilitate the identification of sound medical evidence is to identify high-quality journal., A well-written article, novel in concept and scientifically sound research design qualifies for a good paper. The demand to publish due to ‘publish or perish’ culture among research and academic institutions is increasing, but it should also be noted that only a highly ranked publication can propel young researchers in their academic careers. Researchers should also be aware of ‘hijacked’ journals. These are respected journals, usually with an IF from Clarivate Analytics (formerly known as Thomson Reuters) for which someone has created a counterfeit website. The counterfeiters then send spam e-mails acting as if they were the real publishers of the journal. They accept all submissions and charge the authors. Their victims are typically author seeking fast publishing in IF journals. Free submission and publication are a significant factor for individual health researchers. In the presence of external funding or grants, authors would not be deterred to publish by paying publication charges and may even consider journal reputation with high impact and OA. Grant-writing and external funding are still not fully explored by the Indian health researchers. By far, predatory publishers damage science more than anything else. They do not faithfully manage peer review, allowing questionable science to be published as if it had passed a strong peer review. We know that peer review often results in papers being rejected for publication, but this rejection is contrary to the business model of many OA publishers, because they only want to generate as much revenue as possible. Another most important harm posed by the predatory journals is that they never archive their content in third-party sites such as (Controlled Lots of Copies Keeps Stuff Safe: A community-governed archive). Since the journals are founded solely for financial reasons, they are likely to cease publication when profits decline or investors turn their attention elsewhere. Keeping all this in mind, even before starting to write a research article, the researchers should first explore the JCR indexed Journal list as to which will best suit for their work to be published and should go according to the instructions given on the journal home for article writing and submission. The ethical issues related to predatory journals are summarised in [Table 1]. Recently, some vigilant researchers are now raising the alarm against this predatory menace which they describe as the proliferation of online journals that will print seemingly anything for a fee, but this also warns you on the other hand that non-experts doing online research on choosing journals will face trouble in distinguishing credible research journals from predatory ones, with a recent article published in by Prasad in ‘The Hindu’, dated 12th March 2018 New Delhi edition, a daily Indian newspaper, which reveals that according to the BMC Medicine paper, around 35% of authors in such journals were from India and 27% of predatory journal publishers were also based here, thus making India the number one country in both categories. A September 2017 paper in Nature found that authors from India accounted for 27% of the 1907 papers published in predatory journal. From initially being duped into publishing papers in these journals, researchers in India, particularly those from state universities are now actively seeking out such journals. Recently, a critical analysis has been published in Current Science (March 2018 issue), elaborating on the serious re-consideration of the current University Grants Commission (UGC)-approved list of journals, suggesting that there is an urgent need to form new regulations to curtail unethical practices in scientific publishing along with some awareness programmes being organised about publication ethics at Indian universities and research institutes. The UGC may perhaps be responsible for this as they introduced this Academic Performance Indicators (API) system in most of the state colleges and universities for grabbing an academic position and promotion assessment along with a second mandate that every PhD scholar has to publish at least two research papers before their thesis submission. Nonetheless, this policy of UGC has undoubtedly led to a sudden and huge demand for journals that willingly publish substandard papers for a small fee. With this huge pressure, last year in January 2017, the UGC introduced a whitelist of journals where researchers could publish to meet the API conditions. UGC also has released a list of 38,653 approved journals for the purpose of Career Advancement Scheme. The whitelist prepared by UGC has at least 200 predatory journals, but as on 9th April 2018, the access link is no more available. Several organisations also have started conducting symposia on creating awareness on predatory publishing, last year one such symposium had been organised by the European Association of Science Editors on predatory journals at 5th World Conference on Research Integrity, in Amsterdam, in May 2017. Nevertheless, on the other hand, several other studies revealed that India is among the major contributors of articles published in poor-quality predatory OA journals,,, thus contributing to duality in scientific publishing in India. Seethapathy et al. stated that India not only publishes the majority number of predatory journals in the world but also Indian researchers are among one of the biggest contributors to such journals. Not only this various organisations such as ICAR, CSIR and ICMR laboratories but also other national institutes such as IITs and NITs have fallen fate to these predatory journals. This exceeding number of publications in predatory journals caught the attention of Nature, one of the most competitive and well-regarded scientific journals and they have explored whether it was better to blacklist them or create a ‘white list’ of those OA journals that meet certain standards of research publications, therefore Nature included a checklist on ‘how to perform due diligence before submitting to a journal or a publisher’. The history of scientific excellence, progress in scientific research and science education in India dates back from centuries and an analytic database called ‘Nature Index’ launched in 2014 by the Nature Publishing Group highlighted that India's research outputs have grown steadily since 2012 and ranks 13th for its high-quality scientific publications in an independently selected group of 68 high-quality scientific journals. Recently, it has been also stated clearly that how harmful predatory journals are in medicine and related fields and it means that the research which is not read does not exist. How to identify the predatory journals? Predatory journals and publishers are difficult to identify but not impossible to do so. Unfortunately, the main reason is that predatory publishing is often confused with OA publishing, which is a boon to scientific communications. Therefore, distinguishing between genuine and predatory OA publishers is a challenge for many. 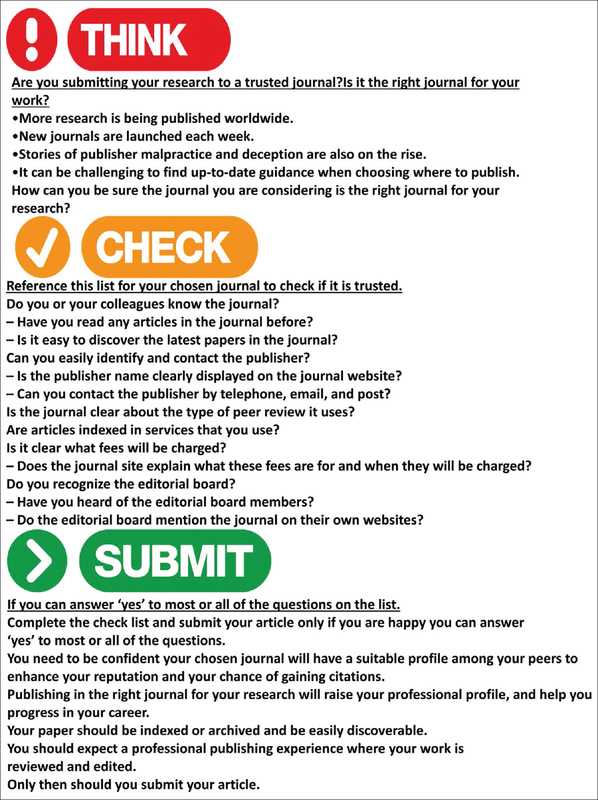 However, still, before one proceeds for selecting a journal for publishing, there are several checkpoints available as of now to warn you about the predatory publishers in general. First and foremost is the Beall's list to be looked on. Furthermore, to help the researchers in choosing the right journal for publishing their research work, a movement called as ‘Think Check Submit’ was started by representatives of different publishing groups worldwide, namely Association of Learned and Professional Society Publishers, DOAJ, International Network for the Availability of Scientific Publications, ISSN, Association of European Research Libraries, OASPA, The International Association of STM Publishers, UKSG and individual publishers, which is a cross-industry led initiative by which checklist/points made by them can be followed [Figure 1] to make sure that one is choosing trusted journals for their respective research. According to the World Association of Medical Editors (WAMEs), a global nonprofit voluntary association of editors of peer-reviewed medical journals has a policy statement for identification of these predatory journals given on their website: http://www.wame.org/policy-statements#Definition PR. It provides a very informative review about the facts on predatory journals on various topics such as Identifying Predatory or Pseudo-Journals, WAME Professionalism Code of Conduct, WAME Editorial: Conflict of Interest in Peer-Reviewed Medical Journals: The WAME Position on a Challenging Problem, Definition of a Peer-Reviewed Journal. For a journal to be considered as a peer-reviewed, it should have obtained external reviews for the majority of manuscripts it publishes, including all original research and review articles. The other condition for it is that a manuscript should have been reviewed by at least one external reviewer; typically, comprising of two reviewers and sometimes more opinions can be also sought. Such journal should always state their peer-review policies, including which kinds of articles are peer-reviewed and by how many reviewers, in the instructions for authors and this should be fully ensured by the journal's editor. The severe impact of publications in predatory journals compelled the Medical Council of India to introduce the rule that publications in e-journals cannot be used in the assessments for appointments or promotions in medical institutions. Another similar small working group of general medical journal editors known as ICMJE have some recommendations to review the best practice and ethical standards in the conduct and reporting of research and other material published in medical journals and to help authors, editors and others involved in peer review process and also the biomedical publishing fraternity to create and distribute clear and valid medical journal articles. They provide useful insights into the medical editing and publishing process for the media, patients and their families and general readers, so one should meticulously follow these guidelines for publishing any medical research papers from clinical trials especially, as the results have a direct influence and relation to the patient's well-being and health, which the pseudo-journals do not follow and thus resulting in reporting of fraud results which are very fatal for the society. Another option which one can easily avail is to refer to DOAJ which is a community-curated online directory that indexes and provides access to high quality, OA, peer-reviewed journals. Being an independent entity, all funding for it is through donations, 50% of which comes from sponsors and 50% from members and publisher members. It provides the services free of cost, including being indexed in DOAJ. Data are available for public, aiming specifically to increase the visibility and ease of use of OA scientific and scholarly journals to increase their usage and impact. More importantly, to ensure that research and publication integrity is maintained, it is essentially required that the institutions and journals cooperate with each other on all aspects of research and publication integrity, which has been set by COPE, which is not followed by predatory journals. Predatory journals do not follow the COPE guidelines on publication ethics which strictly focus on research misconduct and transparency among authors and research integrity. These are some of the best practice guidelines on publication ethics and have been ardently written for a framework developed to implement their own publication ethics policies and systems. The Best Practice Guidelines on Publication Ethics have been written to offer journal editors a framework for developing and implementing their own publication ethics policies and systems. Hence, it is very important for all the researchers worldwide to be fully aware of the existence and knowledge about these predatory journals and avoid the bait that they throw to catch the research articles. It is all about fraud, deception and irresponsibility, which can never be tolerated in science and must be addressed critically, thus focusing on an urgent need to develop a mechanism both by institutes and funding agencies to identify the quality of the articles published by the respective institutes and researchers. Furthermore, medical researchers with enough scientific passion at medical colleges/institutes/organisations should also be encouraged to improve their quality of research and submit their publications to recognised scientific peer-reviewed journals. Therefore, one should be cautious at all levels, think before they submit and also advise others of the hazardous world of predatory publishers and their journals. One more aspect which might help in preventing these journals to flourish may be to do a research in future to understand that why some authors publish in these journals, as such knowledge will surely be a great help in developing programs to prevent submissions to predatory journals. Only then can the menace of these predatory journals be reduced, making the research more effective in terms of reaching the society and people who are the ultimate beneficiaries of the outcome. Available from: https://www.beallslist.weebly.com. [Last accessed on 2018 Feb 18]. Available from: https://www.art.yale.edu/file_columns/0000/2306/kolata.pdf. [Last accessed on 2018 Feb18]. Available from: https://www.web.archive.org/web/2017011 21 25427. [Last accessed on 2018 Feb18]. Available from: https://www.scholarlyoa.com/publishers. [Last accessed on 2018 Feb18]. Available from: https://www.nlm.nih.gov/bsd. [Last accessed on 2018 Feb18]. Available from: https://www.ncbi.nlm.nih.gov/abs/journals. [Last accessed on 2018 Feb18]. Available from: https://www.ncbi.nlm.nih.gov/nlmcatalog/journals. [Last accessed on 2018 Feb18]. Available from: https://www.doaj.org/search. [Last accessed on 2018 Feb18]. Available from: http://www.ipscience.thoms-onreuters.com/mjl. [Last accessed on 2018 Feb18]. Available from: https://www.publons.com/journal/?order_by=reviews. [Last accessed on 2018 Feb18]. Available from: http://www.oaspa.org/membership/members. [Last accessed on 2018 Feb 20]. Available from: http://www.publicationethics.org/members/journals/?f=bundle%3Ajournal. [Last accessed on 2018 Feb 20]. Available from: http://www.icmje.org/journals following the-icmje-recommen-dations. [Last accessed on 2018 Feb 20]. Available from: http://www.stmassoc.org/membership/our-members. [Last accessed on 2018 Feb 20]. Cobey K. Center for journalology website. Euro pean Sci Edit 2018;44:16. Memon AR. Beall's list has vanished: What next? J Orthop Sports Phys Ther 2017;47:222-23. Jain NC. Predatory journals. Indian J Med Microbiol 2015;33:426. Available from: https://www.library.gmu.edu/tutorials/impact-factor(18). [Last accessed on 2018 Feb 20]. Burt BA, Eklund SA. Reading the dental literature. In: Dentistry, Dental Practice, and the Community. 6th ed. St. Louis: Elsevier Saundersl 2005. p. 154-61. Shokraneh F, Ilghami R, Masoomi R, Amanollahi A. How to select a journal to submit and publish your biomedical paper? Bioimpacts 2012;2:61-8. Lee KP, Schotland M, Bacchetti P, Bero LA. Association of journal quality indicators with methodological quality of clinical research articles. JAMA 2002;287:2805-8. Bowman DE, Wallace MB. Predatory journals: A serious complication in the scholarly publishing landscape. Gastrointest Endosc 2018;87:273-4. Sandesh N, Wahrekar S. Choosing the scientific journal for publishing research work: Perceptions of medical and dental researchers. Clujul Med 2017;90:196-202. Available from: https://www.clockss.org/clockss/Home(18). [Last accessed on 2018 Mar 15]. Ferris LE, Winker MA. Ethical issues in publishing in predatory journals. Biochem Med (Zagreb) 2017;27:279-84. Prasad R. A Curse to Science. The Hindu. Opinion-Comments Section; 2018. Patwardhan B, Nagarkar S, Gadre SR, Lakhotia SC, Katoch VM, Moher D. A critical analysis of the UGC-approved list of journals. Curr Sci 2018;114:1299-303. Available from: http://www.ugc.ac.in/ugc_notices.aspx?id=1604. [Last accessed on 2018 Feb 20]. Xia J, Harmon JL, Connolly KG, Donnelly RM, Ander-son MR, Howard HA. Who publishes in predatory journals? J Assoc Inf Sci 2014;66:1406-17. Shen C, Björk BC. “Predatory” open access: A longitudinal study of article volumes and market characteristics. BMC Med 2015;13:230. Seethapathy GS, Kumar JU, Hareesha AS. India's scientific publication in predatory journals: Need for regulating quality of Indian science and education. Curr Sci 2016;111:1759-64. Kogleck L, Priyadarshini S, Pincock S, Bocquet A, GillochC. Nature Index analysis 2014: India's Ascent Towards World-Class Science; 2015. Available from: http://www.nature.index.com/news/indian-science-ascending.(18). [Last accessed on 2018 Feb 20]. Donovan SK. Predatory journals: Research that isn't read doesn't exist. Nature 2017;550:188. Available from: https://www.thinkchecksubmit.org/.(18). [Last accessed on 2018 Feb 20]. Available from: http://www.wame.org/policy-statements#Definition.PR.(18). [Last accessed on 2018 Feb 20]. Aggarwal R, Gogtay N, Kumar R, Sahni P, Indian Association of Medical Journal Editors. The revised guidelines of the medical council of India for the academic promotions: Need for a rethink. J Conserv Dent 2016;19:1-4. Wager E, Kleinert S. Cooperation between research institutions and journals on research integrity cases: Guidance from the committee on publication ethics (cope). Acta Inform Med 2012;20:136-40. Graf C, Deakin L, Docking M, Jones J, Joshua S, McKerahan T, et al. Best practice guidelines on publishing ethics: A publisher's perspective, 2nd edition. Adv Mater 2015;27:370-87.